- Cranberry red candle, scented with grapefruit, pine and rosemary. "Let me harness my fears in a positive way to create strength in difficult situations. Give me a warrior's confidence to do what is right, not what is easy." 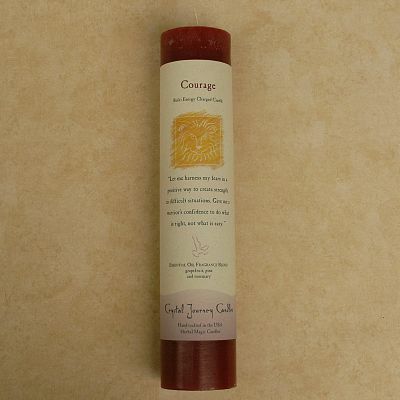 Do you have any other questions about our Reiki-Charged Courage Pillar Candle? I bought this candle for my mom for Christmas, and two other ones (Confidence & Protection) for other family members and they're really nice. They smell great, and there are enough of them that you can make the one you pick out very personal for the person you are giving it to. My only regret was that I didn't buy one for myself at the time I put in my order. ;) I will next time. Very nice product and nice people who run the place, as well.